We’re considering features like spellcheck, word count, proofread, revisions, and shortlink available in the new editor and if/how they should best be introduced into the new editor. If you have a suggestion or bug you don’t see here, please add it to the conversation. We’ve heard your comments about the new editor being smaller than the classic and we’ve increased the width of the editor in your browser. The next time you select to use the classic editor instead of the new editor, we’ll remember it! From then on you’ll be directed back to the classic view instead, you won’t have to select it every time. Note, if you end up having to clear your cookies for any reason, you’ll need to opt out of the new editor again. The Featured Image selection now allows you to choose images from your Media > Gallery. Big package of bug fixes released. A world of thank-you’s to all of the users who have assisted with gathering bug information. More updates and fixes are on the way. Please start a new support thread for any new bugs that you encounter and would like to report. We deployed some recent updates to the editor preference. Now, if you switch back to the classic editor, you should consistently be directed to your Dashboard through all “New Post” and “Edit Post” links across your site. You’ll also see a message that will allow you to switch back to the new editor at any point if you want to give it a try! The new editor will now remember your link target. If you decide to set a link to open up in a new window, it will be remembered when you enter your next link. There was an issue with italicizing and quoting in the new editor, but it has been fixed by our developers! Please note that the link will only show up if you save a draft or edit an existing post! As many of may have noticed already, the spell checker has been added to the new post editor. 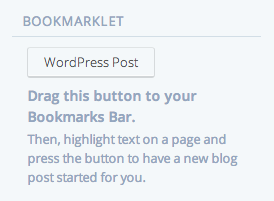 And the developers have added an awesome bookmarklet to make quoting other articles super quick and easy! You’ll find this under the ‘Advanced Settings’ dropdown. The topic ‘New Post Editor Improvements’ is closed to new replies.